I bought the Quality 3-Port HDMI Switch with Remote and 2 x 50cm Pro Series HDMI Cables from Cable Chick. Firstly, thanks for the amazingly prompt delivery! For the service to be any quicker you would have to guess what the customers want! I installed the switch last weekend. Thankfully the device being as small as it is allowed it to fit exactly where I wanted it. Installation was simple and I could see no deterioration in the quality of the TV image. I'm completely satisfied with both the quality of the product and the service from Cable Chick and am already eyeing off some other items I'm likely to need. Happy to recommend the company to anyone. Amped Slimline S-Video and 3x RCA Composite + L & R Audio (Brushed Aluminium Wall Plate) + FREE SHIPPING! Useless fact #506: A cockroach can live for several weeks after its head has been cut off! Ewwwww! No wonder those critters are indestructible! Another seemingly invincible critter is the Amped Slimline S-Video and 3x RCA Composite + L&R Audio (Brushed Aluminium Wall Plate). Known to inhabit narrow, dark spaces in your home, it blends in seamlessly with its surroundings due to high quality styling of the armoured face plate. Being only 4mm thick allows the wall plate to scuttle into the smallest of places around your living room while transmitting superb signal quality via it's many 24k gold plated contacts. 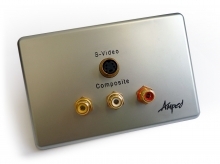 The high quality interior components allow the wall plate to operate on a varying diet of S-Video (SVHS), RCA Composite video and L&R audio channels. The use of female-to-female connectors means that this hardy critter can't breed, but does make life easier by allowing you to use pre-terminated male-to-male cables in order to keep it fed with AV signals. You won't need any soldering equipment or wiring experience – just use the included template to craft a home for your wall plate and use the included screws to secure it. It may not survive a nuclear blast, but it will definitely survive almost anything else thanks to an exclusive 10 year guarantee! Don't you wish everything was built to last like this?